I hear it all the time, “I have to have zigzag stitch to finish seams”. Although you can use a zigzag stitch to prevent a seam from raveling, it’s far from the only good option. I’m pretty sure that many articles of clothing were made and worn long before home sewing machines were sold with a zigzag stitch, and I’m pretty sure that these clothes didn’t routinely fall apart in the wash. 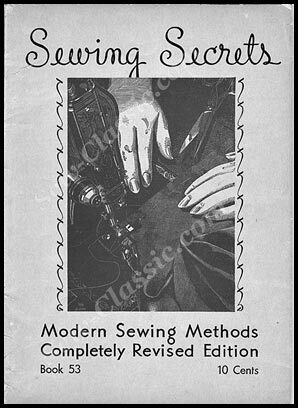 I was perusing one of my vintage sewing publications, and discovered a wonderful section on seam options and finishes for a straight stitch sewing machine. So, I scanned the section about the various seam and seam finish options using only a straight stitch. I converted these pages into a PRINTABLE PDF to share with everyone on my blog. The book is from 1934 and published by the SPOOL COTTON COMPANY. This is the company that we now today as Coats & Clark. Click on the cover image to download the file. Previous How Much is a Vintage Sewing Machine Worth?